By almost any metric, tonight’s Carolina-Duke game features a clash between the two best active coaches in the history of college basketball. Not only are we lucky to have the greatest rivalry in the sport under our collective noses, we are again watching the two best current coaches in the land – similar to when Dean Smith and Mike Krzyzewski tangled in the 1990s. Head to head, since Ol’ Roy returned to Chapel Hill as the head coach in April of 2003, Duke and Carolina have meet 33 times in the last 15 years, home and home each season and three ACC tournament match-ups. Coach K has the upper hand with a 19-14 record, which most people would guess given the Blue Devils’ excellence over that time. But ask your best UNC buddy who has a better NCAA tournament record during that same head-to-head period. Krzyzewski is 34-13 in 15 tourneys for a 72.3 winning percentage. Williams is 43-11 over that span, which includes three national championships, for a 79.6 percentage in 14 trips to the Big Dance (remember, the Tar Heels missed out in 2010). Despite the Duke PR machine, which has the average fan believing the Blue Devils go to the Final Four every year, it is Carolina with five trips there in the Roy-K era compared to Duke’s three. While Zion Williamson and other one-and-dones have sucked the oxygen out virtually every discussion, the Tar Heels have been to two national championship games (winning one) since Duke last reached the Final Four in 2015. Williams also holds the best record in the history of college basketball for opening games of the tournament, 28-0, while Krzyzewski has been one-and-done in the NCAAs five times, losing Duke’s opener in 1984 to Washington, 1996 to Eastern Michigan, 2007 to VCU, 2012 to Lehigh and 2014 to Mercer. So K has coached the most one-and-dones in two different categories. 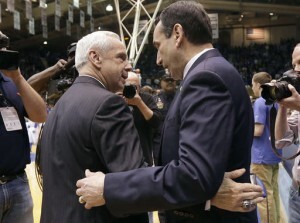 Krzyzewski began as a head coach at Army when he was 28 and at Duke at 33. Williams began at Kansas when he was 38. Roy’s been closing that gap ever since.